After 5 years of running successful kid’s sewing classes and camps, I’ve developed a Sewing Class Checklist for Teachers to help keep me organized. The checklist includes notes about snacks, first aid kit, sewing supplies and even a reminder about eyeglasses for me. I hope you find value in it. Sewing machine(s) with a speed controller. This is especially important for younger students as they only know one speed – and this usually involves mashing the foot pedal all the way to the floor. You can find both mechanical and computerized machines with a speed controller, but this feature will cost a little more. Do not automatically assume the computerized machine on sale for under $100 at the big box store has a speed controller. Verify before you buy! Extra sewing machine feet: open toe foot, 1/4″ foot and a walking foot. Heavy duty extension cord and power strip. Just. keep. them. handy. Classroom sewing basket with community supplies. Small scissors for little hands; add a pair of lefty scissors while you’re at it. Use GLASS head pins and little clips to hold fabric pieces together for sewing. Be sure to demonstrate proper pinning techniques. Keep small baskets of fabric scraps within student reach to keep them busy while waiting for assistance. Choose simple projects. Track how long it takes you to make an item and then double it. Triple that number for brand new stitchers. For a 2 hour class, If you can’t make the item in less than 30-45 minutes, select a different project. Make 1-2 samples of finished projects. HAVE FUN and maintain your SENSE OF HUMOR! Remember, you are dealing with kids and anything can/will happen! Keep classes 90-120 minutes in length. Incorporate a 10 minute snack time about 1/2 way through class. Arrive 30 minutes early. Set up any student machines you’re providing for use during class, set out scrap baskets, snacks and the community sewing basket. As students arrive, have them (and grandma or other adult attending class with them) fill out a name tag. Have students set up their machines and encourage them to “warm up” using fabric scraps found in the baskets. Start class on-time. Handle introductions, bathroom location, snack availability and other housekeeping matters before diving into the sewing project. Show the sample and review first few steps. No worries if a student does not have a 1/4″ foot – instruct them to use the outside edge of the presser foot as a guide. Monitor progress to keep everyone near the same step of the project. Circulate among students, offering praise and assistance. Do not be afraid to stop the class to reteach a concept. If you find one student doing something incorrectly, chances are another student is, as well. Demonstrate your process for sewing, but remind students that there is no single right way to sew. This is especially helpful if Mom/Grandma does things a little differently than you do. Allow time for show & tell. If other customers are in the shop, encourage students to go show the grown-ups what they’ve made. Take pictures during class (if you remember), but definitely during show and tell. End as close to on-time as possible (15 minutes over is usually ok) and have students help clean-up the classroom before leaving. Be sure to give any project hand-outs to grown-ups accompanying students. Most students don’t care, but the grown-ups sure do. Give students a fun activity as a takeaway. It can be a sewing graphic to color, cartoon word search or matching game. Include your contact information or business card with it. Always thank the students, their adult chaperones and the shop/venue staff. Leave the classroom space better than you found it. Turn off irons. Return tools to their proper places. Empty individual trash bins. Donate any snacks the kids didn’t eat to the community snack table. Inquire about food allergies in advance. I have a “no-peanut rule” for the snacks I provide, unless I’ve taught the students previously and I’ve determined no nut allergies exist. Inquire if students have asthma. If your project requires the use of basting spray or highly scented products, you might need to find an alternative – or do that part of the project outside. Try to find out the sewing ability of students BEFORE class. If you have a class full of students who’ve never touched a sewing machine before in their lives, you’ll need a helper or two (unless Mom/Grandma is staying with them). One of the highlights of my day job is my weekly maker club. Some schools refer to it as Genius Hour or Learning Clubs. Our clubs meet most Fridays and last about an hour. I host 3 different groups of kids during the school year. Members: Max of 12 students per club cycle – 1 adult : 4 students works well. Machines: Six total – a mix of newer mechanical Janome, Singer and Brother machines. As with technology, a 1:1 ratio would be ideal, but we make it work by buddying up with 2 students per machine. Funding: School/PTA is unable to provide funding for clubs (No surprise here as I work in a really high poverty area – 98% free & reduced lunch). My club started with a sewing machine and supplies provided by a Donorschoose.org campaign. Everything else has been donated by local businesses, friends, coworkers, or paid for by me. Projects: Plan for two projects during each 6-8 week club cycle. A small project (potholder or felt stuffie) + 1 larger project (pillowcase, applique pillow) worked well. I always keep fabric scraps out for them to practice machine stitching. If one of the group leaders must be out, we have a craft activity as backup (Clover pom pom makers and pom pom critters were a HUGE hit). Hand embroidery is an activity that will be added to next year’s activity line-up. For alternate activities that are free: have students measure/sort fabric & inventory club supplies, watch a video clip (how thread/fabric is made by Cotton + Steel are GREAT videos), design fabric (by hand or using school software), search Pinterest or other preselected sites for projects that interest them. Of course, if your school will allow you to charge a small supply fee, you can do even more projects. Club Schedule: Sign in, snack (every other time), quick overview and get to work. Stop 10 minutes early to clean up. Supply Storage: My club meets in the library. I have a locked cabinet and a set of shelves in the storage room for my club supplies. Sad to say, but stuff has a habit of disappearing at my school. Scissors, pom pom makers and machines are all locked up in the cabinet or my office. If I did not have a space to store sewing machines, we would be limited to mostly hand sewing projects. When the day comes that I run this as an after school club, I will invest in a folding flat cart to transport machines and supplies. (I plan to have 4 of the same kind of sewing machine – computerized with a speed controller). I will also have more time for set-up and take-down (which I do not have now). What makes it work for us: Pre-cut all projects ahead of time. Designate two helpers who can come 10 minutes early to help set out sewing machines and tools prior to club. I’ve also found snack-time to be a good way to give me an extra 10 minutes if I need it. Select projects based on student input and the supplies you already have on hand. My sewing friends have been exceedingly generous with de-stashing their unwanted fabric and sewing supplies in my direction. What’s in it for me? Right now, I am able to use my maker club as an idea incubator/testing ground for potential projects to offer in Saturday Kid’s Club at the quilt shop or summer sewing camps. I also get to view sewing through a newbie’s eyes on a regular basis. Those of us who’ve been sewing for a long time tend to forget what it’s like to be in their shoes. How can I use this experience to grow my crafty biz? While visiting my niece in Boston, I wandered into a crafty maker space called Gather Here. I LOVED the concept. This gave me the idea to offer a mobile craft/stitch lab that catered to after-school and homeschool groups. The existing day job makes it a bit of a challenge at the moment, but one day I can see myself offering after-school clubs at local elementary schools or in RV parks as we toodle around the USA. Also check out my Pinterest pages for kid’s sewing projects (here and here) and be sure to review the wealth of information on my Virtual Sewing Classroom website. 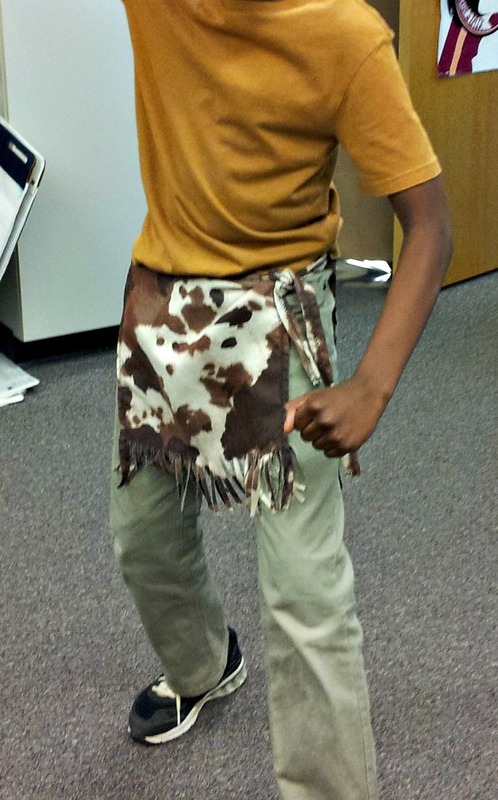 Recently, a coworker asked me to make a loincloth as part of her son’s Native American costume for a 4th grade class assignment. Mom had already purchased a length of suede-like dressmaker fabric. 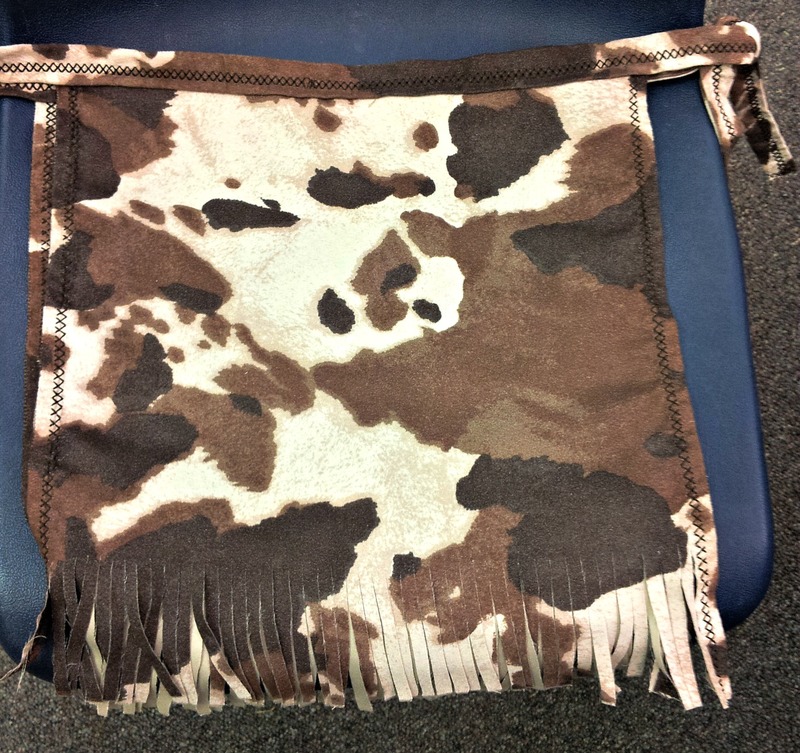 Her son wanted a “REAL” loin cloth that tied at the sides – not like a skirt. Some historical pictures of Native American costumes depict breech cloths as rather long, almost mid-calf length. For safety reasons, I opted to keep this one knee length. I couldn’t find a tutorial online, so I thought I’d share how I made mine. Construction time took about an hour. (M1) Measure student around the waist. Divide this measurement in half. Add 2″ to this measurement. Record _________. (M2) Measure student from waist to about just above the knee. Add 2″ to this measurement. Record ____________. (1) Cut two pieces of fabric M1 x M2. (I cut two piece 14″ x 14″). (2) Cut two strips of fabric 2-1/2″ x WOF. (1) Press under 1/2″ double hem on sides. Topstitch, using decorative stitch if desired. I used stitch 57 on my Janome 6600. Repeat for other panel. (2) Add 24″ to M1 measurement. Trim 2-1/2″ wide strips to this length. 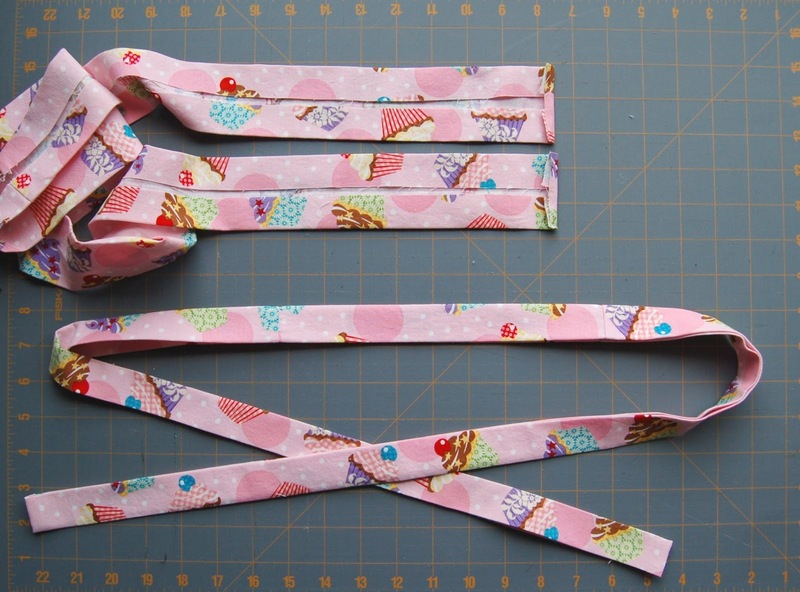 (3) Press 2.5″ strips in half lengthwise (for the waistband & ties). Open and press raw edges so they meet at the fold line in the middle. Fold again, enclosing the raw edges. Press well. Here’s a picture if you need a visual. (4) Slide each loin cloth panel inside a waistband. Adjust so that loincloth is in the middle and ties are even on each side. Pin in place and sew along edges using decorative stitch. (1) Measure up 3″ on each side from the bottom on each panel. Either draw a line across at the 3″ mark or mark with a piece of painter’s tape. Cut fringe in desired widths up to the marked line. Remove tape and fluff. Repeat for other panel. Here’s a cute video of how to make a loincloth from a brown paper bag. Add 6″ to length and cut fringe strips about 3/8″ to 1/2″ wide. Make the fringe 10″ long. The original fringe was 3″ long and about 1/4″ wide. Add 4-6″ to width to give a little extra room to fit over clothes.